Summary: Everglades National Park (ENP) is a hydro-ecologically enriched wetland with varying salinity contents, which is a concern for terrestrial ecosystem balance and its nearby urban sustainability. 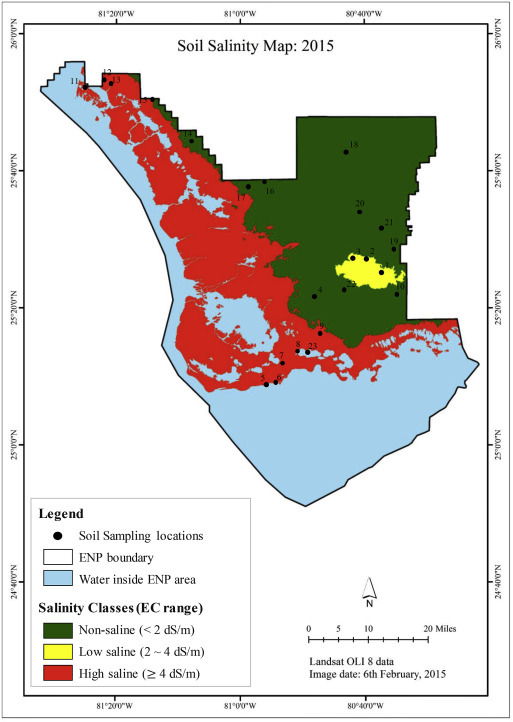 In this study, spatio-temporal soil salinity maps are created using remote sensing techniques, coupled with literature review to understand vegetation salt tolerance properties, and field assessments entailing insitu electric conductivity (EC) measurements. The mapping first entailed the execution of a supervised machine learning technique—the maximum likelihood classification algorithm—to delineate seven vegetation-based land cover classes for the area, namely, mangrove forest, mangrove scrub, low-density forest, sawgrass, prairies and marshes, barren lands with woodland hammock and water, for the years 1996, 2000, 2006, 2010 and 2015. The classifications for 1996–2010 yielded accuracies of 82%–94%, and the 2015 classification was supported through ground truthing. Afterwards, EC tolerance thresholds for each vegetation class were established, which yielded soil salinity maps comprising four soil salinity classes—i.e., the non- (EC = 0–2 dS/m), low- (EC = 2–4 dS/m) and high-saline (EC 4 dS/m) areas. The soil salinity maps visualized the spatial distribution of soil salinity with no significant temporal changes. Furthermore, insitu EC measurements carried out at 23 sampling sites covering all land cover classes mostly validated (91% samples were tested within range) the estimated soil salinity ranges for the latest distribution. The approach of using land cover classes to sense salinity ranges in an urban-proximal ecosystem is pragmatic and application oriented, attributing to novel and useful study upshots considering the diversifying ecological context. This entry was posted in News, Publication, Research. Bookmark the permalink.